↑ Bachmann, Helena (18 March 2002). "Beauty and the Feast". Time. Retrieved 2008-05-22. ↑ "Budapest". Encyclopædia Britannica. Encyclopædia Britannica, Inc.. 2008. http://www.britannica.com/eb/article-9106098/Budapest. Retrieved on 30 ਜਨਵਰੀ 2008. ↑ "2011 Hungarian Census" (PDF). Hungary Central Statistical Office. 27 March 2012. Retrieved 2012-03-27. ↑ "Interactive population pyramids of Budapest (1980-2010)". Hungary Central Statistical Office. Retrieved 2011-05-10. ↑ "Dövényi Zoltán-Kovács Zoltán: A szuburbanizáció térbeni-társadalmi jellemzői Budapest környékén (Spatial and societal parameters of the suburbanization in Budapest)" (PDF). Földrajzi Értesítő (Geographical Report). Retrieved 2011-08-29. ↑ 9.0 9.1 Török, András. "Budapest". Encarta. 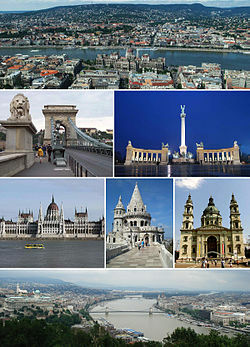 http://encarta.msn.com/encyclopedia_761572648/Budapest.html. Retrieved on 6 ਅਪਰੈਲ 2008.